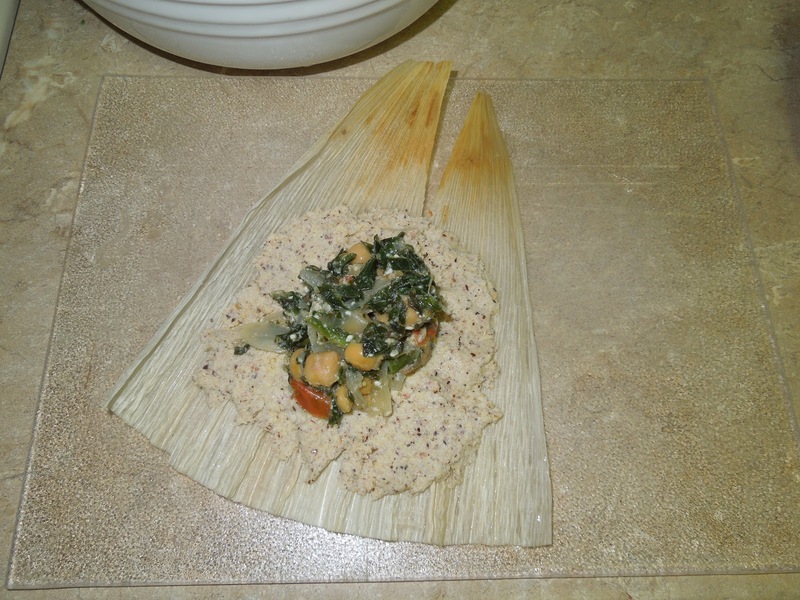 Hold on to your hats everybody because these tamales are downright A-maaahhhzing! I have never been a picky eater and I have always looooooved a variety of foods. This is probably due, largely in part, to super parents who modelled good eating habits and always had us at least try everything once. Case in point, my favorite food as a toddler was escargot (yeah, I ate snails). I did live in Europe at the time, so it is not as far fetched as it sounds, but it shocks me to hear that I may have been more adventurous at that young age than I am now. Anywho, my mom was influenced by many cultures and ethnic groups in her cooking and was always experimenting with new dishes. Ergo, I have always loved Mediterranean, Mexican, Western European, Scandinavian, Southern (U.S.), Indian, Thai (the list goes on and on)….food! 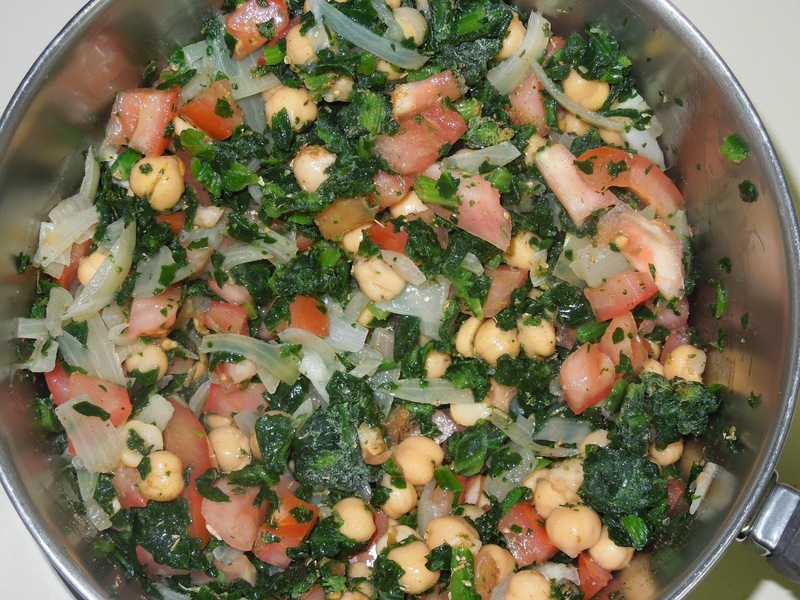 That is why this recipe is so great, it mixes Mediterranean and Mexican flavors and cooking styles, all while being plant-based. 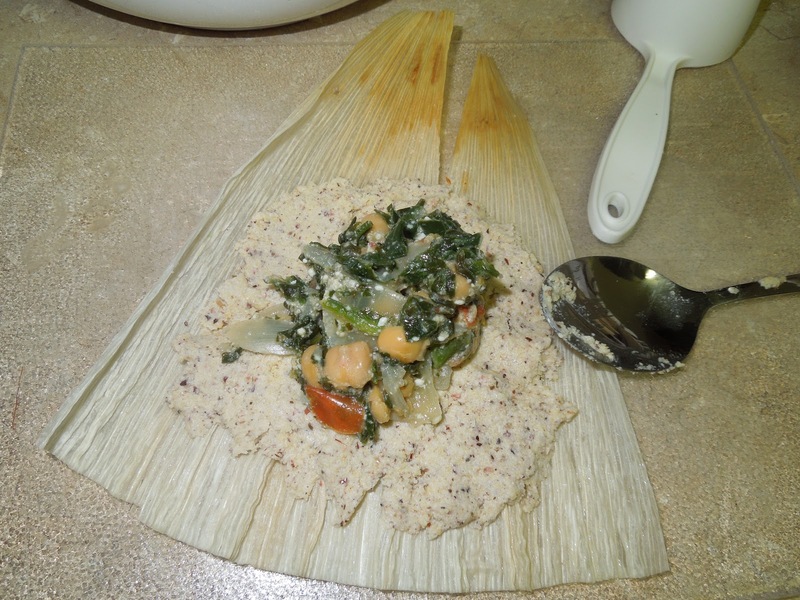 These tamales were a labor of love, but did prove to be worth the time and effort. I will absolultely be making them again and again, especially since I have leftover corn husks!! 1. First prep the corn husks by filling a bowl with warm water and submerging the husks for 30 minutes. Make sure the whole corn husk soaks (some of the ends of my husks stuck out of the bowl and therefore remained a little hard and difficult to fold). 2. While the husks are soaking, you can now move on to making the “dough”. Do this by mixing the masa and the hot water together in a large bowl. Mix remaining ingredients in a separate bowl. 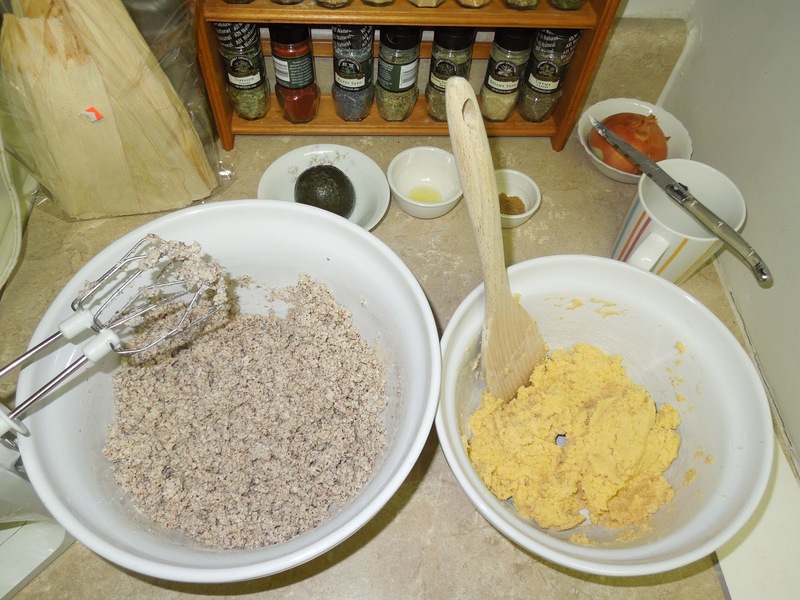 After, use a standing mixer to incorporate the cornmeal mixture into the masa dough. Add 1/2 cup water to make the dough more spreadable, like a thick(ish) paste. 3. Now on to the filling! Put the onions in a deep pan with a splash of water and leave covered on the burner over low-medium heat for 5 minutes. 4. Stir in the remaining ingredients and turn the stove up to medium heat and let it cook for 10 minutes. After, turn off the burner and let the tamale-making begin. 5. Remove husks from the water (remove excess water by patting with a towel) and lay out on a flat, clean surface. Spread about 1/6 – 1/3 cup of dough on each husk (not covering the entire husk) and place 1-2 tbsp of the filling in the middle. I definitely over-stuffed mine, but they still tasted great, so don’t worry too much about making them perfect. 6. Wrap the tamales like a present, fold the longer sides in and the bottoms up. If the husks don’t stay put, take an unused husk, tear some strips off and use those to tightly secure the ends of the husks. 7. Now it is time to steam! Use a large pot (fill about 2/3 with water) and place on a burner on high to boil. Once the water is boiling, place the tamales, “open-edge” side down in a steamer that is placed in the pot, but make sure the water level comes just below the steamer. The water will not touch the tamales. Cover with a lid and reduce the heat somewhat and let the tamales steam for 60 minutes. It may be necessary to add some water to maintain the steam. 8. 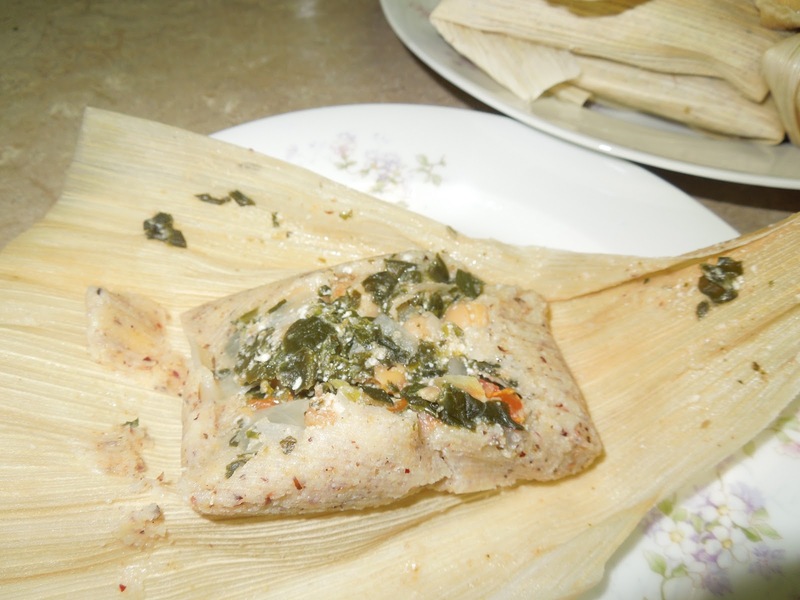 Once the 60 minutes is up, remove the tamales from the steamer (use a utensil, not your fingers–it’s hot!). 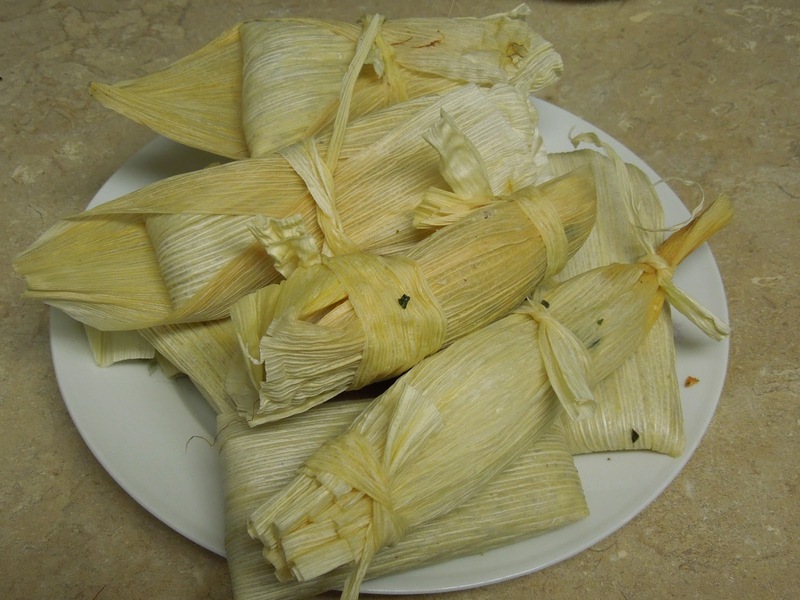 Unwrap the corn husk and allow the tamales to cool. 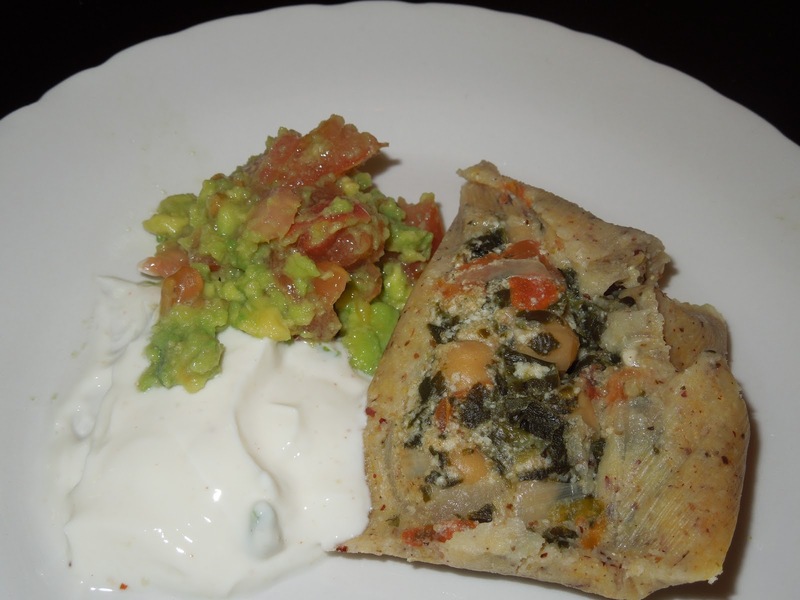 Eat plain, with guacamole or lime-zested yogurt sauce (sooooo good).